Energizing Iron™ w/Eleuthero / 90 softgels - Nature's Way®. Why use an iron supplement? Iron is an essential mineral that transports oxygen throughout the body. Without it, your body can't get enough oxygen, and insufficient oxygen causes lower energy. Iron also is necessary to maintain healthy cells, skin, hair and nails. 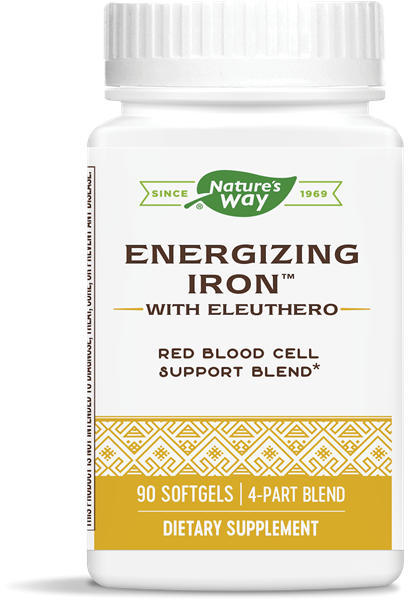 Why take Energizing Iron with Eleuthero? Take 2 softgels once or twice daily, or as recommended by a healthcare professional. If pregnant, nursing, taking any medications or have high blood pressure, consult a healthcare professional before use. Ferrochel® is a registered trademark of Albion Laboratories, Inc. The chelate in this product is covered by U.S. Patent Numbers: 7,838,042 and 6,716,814. Does Energizing Iron with Eleuthero contain heme iron? What exactly is heme iron? What do you do to ensure the safety of glandular extracts? All glandulars used in our products are produced in facilities that are registered and inspected by the United States Department of Agriculture. In addition to federal inspections, all of the glandular materials received at our facility are also subjected to numerous laboratory analyses, including tests for contamination with yeast, molds, and bacteria such as E. coli, Salmonella, and Staphylococcus. Can Energizing Iron with Eleuthero and a calcium supplement be taken at the same time? Research has shown that calcium can interfere with the absorption of iron. Therefore, we recommend taking Energizing Iron with Eleuthero and the calcium supplement at different times of the day, at least two hours apart. Accidental overdose of iron-containing products is a leading cause of fatal poisoning in children under 6. Keep this product out of the reach of children. In case of accidental overdose, call your physician or a Poison Control Center immediately.